This is an original, antique, collectible, sturdy CBL1 Dual-Diode, Power Pentode Tungsram Electron tube. It has an eight contact socket with an anode cup connection. 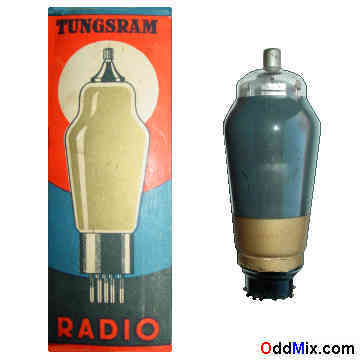 This is a truly old vacuum tube from the beginning of the radio era. The CBL1 is heather-cathode type used as af power amplifier and modulator power tube in radio final stages. The dual diodes used for demodulation and gain control purposes. This tube is useful for old European radio restoration, SW amatur radio and ham special projects or to set up a private vacuum tube museum. It is a used but working tube with original, vintage box. First come first serve only one available!